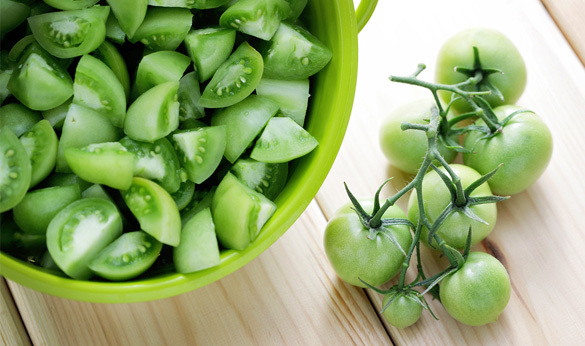 Core the green tomatoes, and slice them 1/4 – 1/2 inch thickness. In a large mixing bowl, whisk together the eggs and buttermilk. In another large mixing bowl combine 1/2 cup of all-purpose flour, 1/2 cup of cornmeal, the paprika, and the black pepper. Add the remaining flour to a small bowl. Dredge each tomato slice in the flour. Dip each tomato slice into the egg mixture. Coat the dipped tomato slices in the cornmeal mixture and set aside on a plate or tray. Add a 1/4 – 1/2 inch of oil to the cast iron pan. Heat over medium high heat. Once the oil is hot, add the breaded tomato slices in batches of 5. Flip once the cooking side has turned golden brown, about 2 minutes. Cook for 2 more minutes. Drain the fried green tomatoes on napkins or a cooling rack. Sprinkle with plenty of Kosher salt. Repeat with remaining tomato slices, replacing and reheating the oil as necessary.